ST. PETERSBURG, Fla. — The new-look Tampa Bay Rays continue to find ways to win baseball games and can close out a sweep of the Los Angeles Angels on Thursday. Tampa Bay (55-53) has won two straight since making three trades Tuesday, including a 7-2 win on Wednesday night with two new faces in the lineup. The Rays are now 19-4 at home since June 11, the best home record in the majors in that span, winning seven of their last eight home series. The Angels are another story. After opening the season a major-league-best 18-8 on the road, they’re just 7-19 away from home since May 30. As much as there were newcomers, some of the same young talents continue to spark the Rays offensively, like rookies Willy Adames and Jake Bauers, who both hit home runs Wednesday. Outfielder Tommy Pham, acquired from the Cardinals, went 0-for-3 with a walk and a run scored in his Rays debut, and pitcher Tyler Glasnow, acquired from the Pirates, pitched three solid innings, allowing just one run in his first Tampa Bay outing. Another relatively new pitcher will get work in relief on Thursday — lefty Jalen Beeks, acquired from the Red Sox last week, will almost certainly fare better in his second Rays outing. 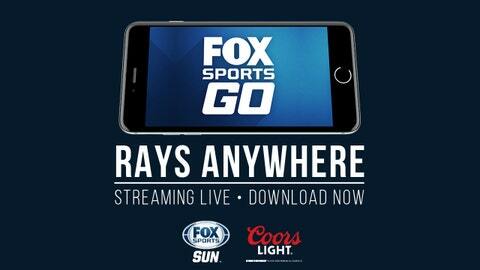 Last week in his Rays debut, he gave up eight earned runs on 10 hits in 3 1/3 innings for a 21.60 ERA. The Rays will start 24-year-old right-hander Hunter Wood (0-0, 3.38 ERA), and Tampa Bay is 3-0 in the games where he’s served as an “opener.” On a staff where relievers are often starters, Wood’s last outing — with a season-high 45 pitches — actually came in relief. He pitched 1 2/3 innings but gave up two earned runs on four hits in a loss to Baltimore. It was the first time in 11 outings that he gave up more than one earned run. Los Angeles, hoping to avoid a sweep, will start 27-year-old lefty Andrew Heaney (6-6, 3.64 ERA), who has no losses in his last four starts. That ERA is down considerably from a 7.06 last season. He’s faced the Rays once this season, throwing six innings on May 19, allowing three hits and four runs (all unearned) while walking a season-high five batters. The Angels (54-55) went 1-for-6 with runners in scoring position Wednesday, staying within two runs until the Rays tagged on three in the eighth to break open a close game. “We had guys on base early for sure, but with our guys in scoring position, they made some pitches and got out of it,” Angels manager Mike Scioscia said. Kole Calhoun homered for the Angels and is batting .294 with 13 home runs and 30 RBIs in 36 games since returning from the disabled list. After Thursday, the Rays stay home for their next six games, with series against the White Sox and Orioles. The Angels go to Cleveland for their next three games, with the next six games back home in Los Angeles.